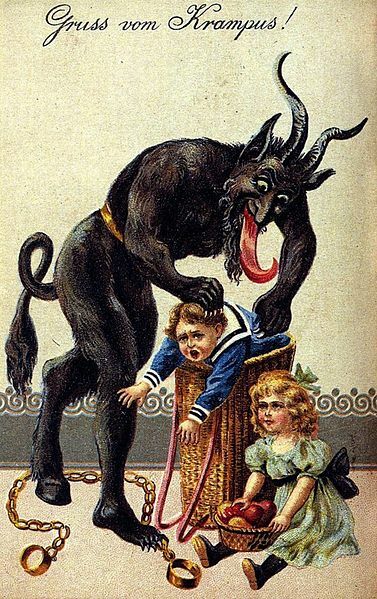 The Krampus, collecting a bad child and stuffing him into his basket. December 6th is the day that Samichlaus is traditionally brewed. Samichlaus was at one time the strongest beer in the world, a malty holiday lager clocking in at 14% ABV. The Hurlimann Brewery made it every December 6th, then conditioned it for 9 months to be released the next holiday season. In 1996, they stopped production, but in 1999 the brand was picked up by Castle Brewery Eggenberg. I’ve brewed a Samichlaus clone twice before. It’s challenging to brew, ferment and condition, but well worth it when the beer is finished. Below I present my modified recipe, based on my brewing and tasting notes for the next time I brew it. In this recipe, I dialed down the amount of crystal 60, added a little bit of aromatic malt and altered the percentages of the other malts slightly compared to my previous brews. Nothing drastic, just fiddling. I also ditched a single decoction mash for a ramped infusion mash and refined the procedures just a bit, based on my previous experiences. The biggest key to brewing this beer is running a good fermentation. The yeast strain chosen — White Labs Zurich Lager yeast — can handle the job if you make a large enough starter. (This is a seasonal yeast from White Labs, available September through October, but your homebrew shop might still have some in stock. If not, brew this next year.) Without the starter, you’d need 9 tubes of yeast (9.2 actually, according to the Mr. Malty calculator). With time, temperature control and a little swirling at the end, you can coax the yeast to get the job done. Samichlaus is, of course, named after Santa Claus, or St. Nicholas. I’ve named this homage Krampus Klaws, after the Krampus, the “Christmas demon.” In Europe, the Krampus is St. Nick’s sidekick. While the good St. Nicholas rewards children for behaving around the holidays, the Krampus punishes them for being bad. December 5th is Krampusnacht (“Night of the Krampus”) every year — if you survive that next year, brew this beer on the 6th. I have also posted brew-in-a-bag (BIAB) and stovetop extract versions of this recipe. A strong, malty holiday lager. Make yeast starter 3 days ahead of brewday from 1 lb. 2 oz. of dried light malt extract. This makes approximately 2.6 gallons of wort at 1.020. You can make the starter in your fermenter, if needed. Aerate the wort thoroughly and pitch the tube of yeast. Ferment starter at 65–68 °F. Each day, aerate wort again for about 30 seconds (if using oxygen) or 3 minutes (if using air). Swirl starter several times a day. To let the yeast settle, let starter beer sit undisturbed for 12 hours prior to brewing. Cooling the starter (for example, if your fermentation chamber) would help. Mash the malts in your kettle. Begin by mashing the grains in 7.6 gallons of brewing liquor. Your initial mash temperature should be 140 °F. Immediately after mashing in, begin heating the mash. Stir constantly and let the mash temperature climb to 153 °F. This ramp should take about 30 minutes. Then hold at 153 °F for another 20 minutes. Add heat again to ramp temperature up to 170 °F. This should take another 30 minutes. Scoop your mash over to your lauter tun and let sit for 5 minutes. Recirculate until the wort clears, then begin running off your wort. Boil the wort hard for about 2.5–3 hours to reduce it to 5.0 gallons. Add hops and Irish moss at times indicated. If hot break appears weak at beginning of boil, add 0.5 tsp. gypsum and 0.5 tsp. calcium carbonate to the boil. Stir in sugar in last 15 minutes of boil. Cool wort to 50 °F. Pour starter beer out of yeast starter. If you made the starter in your fermenter, rack chilled wort onto yeast. Aerate wort thoroughly (and pitch yeast if you made your yeast starter in a vessel other than your fermenter). Ferment at 53 °F. At high kräusen, dissolve the second dose of yeast nutrients in as little water as possible. Heat mixture to 170 °F and hold for 5 minutes to sanitize. Cool and stir into fermentation. When fermentation slows to a crawl, allow temperature to rise to 60 °F and swirl fermenter to rouse yeast. (Do this only once.) Let sit at 60 °F for 3 days once evidence of fermentation (airlock bubbling) stops. Rack beer to a secondary fermenter with little or no headspace and let lager (at refrigerator temperature, around 42 °F) for at least 4 months. When finished, rack to keg and carbonate to 2.3 volumes of CO2. You can brew Krampus Klaws as the second big beer of your day and use the uncollected wort from first beer as the strike water for this beer. If you do this, subtract about 4.0 lbs. (1.8 kg) of Pilsner malt from the recipe above. Reduce Pilsner malt to 4.0 lbs. (1.8 kg) and collect only 8.0 gallons (30 L) of wort, leaving a 2–2.5-hour boil. Add 4.75 lbs. (2.2 kg) of light dried malt extract, stirred in during the last 15 minutes of the boil. Make yeast starter 3 days ahead of brewday from 510 g of dried light malt extract. This makes approximately 10 L of wort at 1.020. You can make the starter in your fermenter, if needed. Aerate the wort thoroughly and pitch the tube of yeast. Ferment starter at 18–20 °C. Each day, aerate wort again for about 30 seconds (if using oxygen) or 3 minutes (if using air). Swirl starter several times a day. To let the yeast settle, let starter beer sit undisturbed for 12 hours prior to brewing. Cooling the starter (for example, if your fermentation chamber) would help. Mash the malts in your kettle. Begin by mashing the grains in 29 L of brewing liquor. Your initial mash temperature should be 60 °C. Immediately after mashing in, begin heating the mash. Stir constantly and let the mash temperature climb to 67 °C. This ramp should take about 30 minutes. Then hold at 67 °C for another 20 minutes. Add heat again to ramp temperature up to 77 °C. This should take another 30 minutes. Scoop your mash over to your lauter tun and let sit for 5 minutes. Recirculate until the wort clears, then begin running off your wort. Boil the wort hard for about 2.5–3 hours to reduce it to 19 L. Add hops and Irish moss at times indicated. If hot break appears weak at beginning of boil, add 0.5 tsp. gypsum and 0.5 tsp calcium carbonate to the boil. Stir in sugar in last 15 minutes of boil. Cool wort to 10 °C. Pour starter beer out of yeast starter. If you made the starter in your fermenter, rack chilled wort onto yeast. Aerate wort thoroughly (and pitch yeast if you made your yeast starter in a vessel other than your fermenter). Ferment at 12 °C. At high kräusen, dissolve second dose of yeast nutrients in as little water as possible. Heat mix to 77 °C and hold for 5 minutes to sanitize. Cool and stir into fermentation. When fermentation slows to a crawl, allow temperature to rise to 16 °C and swirl fermenter to rouse yeast. (Do this only once.) Let sit at 16 °C for 3 days once evidence of fermentation (airlock bubbling) stops. Rack beer to a secondary fermenter with little or no headspace and let lager (at refrigerator temperature, around 5.6 °C) for at least 4 months. When finished, rack to keg and carbonate to 2.3 volumes of CO2. Yum. Samichlaus. This is a great recipe and makes a delicious beer. Can you bottle condition this beer, into German Hefe bottles? If so how much sugar do you add to bottles?